You let me know that you need a drink refill by holding your glass up in the air and tapping on it. I say to you “Yes, it’s a glass”, and keep walking. If you need a refill on your beverage, wait until your server comes back to your table, then say the words “I’d like a drink refill please”. It’s extremely annoying when people do this. I wish I had a pistol attached to my hip like the gunslingers did in the 1800s, so I could blast the glass out of customer’s hands whenever they do this. Josey Wales had a great line about “dining” – Buzzards gotta eat same as worms. Couldnt have said it better myself! I used to bartend, so I never encountered that customer. But, my sympathies to you (as well as the rest of my waitstaff friends) who run into that on a near-nightly basis. You guys are superstars. Thanks. Im glad you can sympathize with people in the customer service industry. A lot of people dont seem to understand how terrible a lot of people are. And its over 1 lousy meal. Reblogged this on A Spoonful of Suga. I used to hold up my glass and mouth, “Water, please.” I thought it saved them a trip to my table to ask whether I need something. I’ll be more sensitive from now. At least you are saying “Water,please” there is nothing wrong with that at all because you are actually being polite and yes, you are saving them a trip. I think its the tapping on the glass that comes across as “Hey slave, fetch me some more water”, and that bugs me to no end. 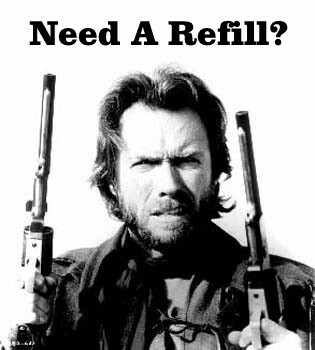 What is the refill time rule? Dont you just spot those whose just about low on their drinks while you are doing your other 10 things? 😉 Not unless the person slurped it down in less than 10 minutes then yes, they should wait! Its when they slurp it down in 5 seconds that I’d make it a point to let them sit there for a bit. Those are usually the same people who tap on their glass for a refill. I love when they hold up their glasses and rattle the ice. This is a ploy to get whatever employee happens to be around to help them. HAHAHA!! So funny because its true. You are sooo funny! I love your blog. I’m a follower. I have a friend who calls for the waitress when we’re out. So embarrassing. Luckily it’s not a friend i see often but every now and then i forget and suffer the consequences. How are some of us born with the super obvious knowledge of how to act around people and some people are not lol. Careful with those guns. You might hit their IPhone. Snapping drives me crazy. I’m not a dog… did you bring your dog in here? That’s illegal, please leave. Snap! Snap! Hey boy, Im ready to order! – Some English guy did that to me when I first started serving. I didnt know what to think or do because I didnt know any better. Would love to see that guy now. When it happened to me I turned around really quickly with a tray full of drinks and just about dumped it all over the guys lap, part of me just wished I had dropped it on him anyway. They should respect us (Bartenders, Server etc.) they will never know what we are capable off. Indeed they should! Go team bartenders411! !